BuildWashington.com is brought to you by the Associated General Contractors (AGC) of Washington and the Inland Northwest AGC to help educate high-school students about the benefits of choosing a career in the construction industry -- where both training and career opportunities abound, and reward and satisfaction are plentiful. 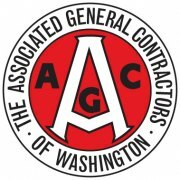 AGC of Washington is the premier professional association of contractors in the State of Washington, committed to enhancing the performance of our members, representing their interests and building a better climate for construction. AGC offers a comprehensive program of industry information, training, networking, education, representation and safety support services to our members. One of 92 chapters of AGC of America, AGC of Washington exercises jurisdiction over building, heavy, municipal and utility, marine, industrial and highway construction in the portion of the State of Washington west of the 120th meridian, except the five-and-one-half counties of southwest Washington -- Klickitat, Skamania, Clark, Cowlitz and Wahkiakum, and the portion of Pacific County south of a straight line made by extending the north boundary line of Wahkiakum County west to the Pacific Ocean. The Inland Northwest AGC is a membership organization dedicated to furthering the ever-changing agenda of commercial construction contractors. We are the leading national construction trade association representing all facets of commercial construction for both public and private entities, including building, heavy, highway and municipal projects. Founded in 1921, the Inland Northwest chapter is the region's largest full-service commercial construction trade association and is one of 92 chapters of the Associated General Contractors of America. Representing over 275 companies throughout our region, the AGC has been the organization of choice for those associated with the construction industry for more than 90 years, and continues to serve as the voice of the construction industry.